Last light bleeds across the peaks of (l-r) Changtse, Mount Everest and Nuptse. This classic Himalayan panorama from the viewpoint at Kala Patthar (5645m) features the receding Khumbu glacier in the foreground as well. 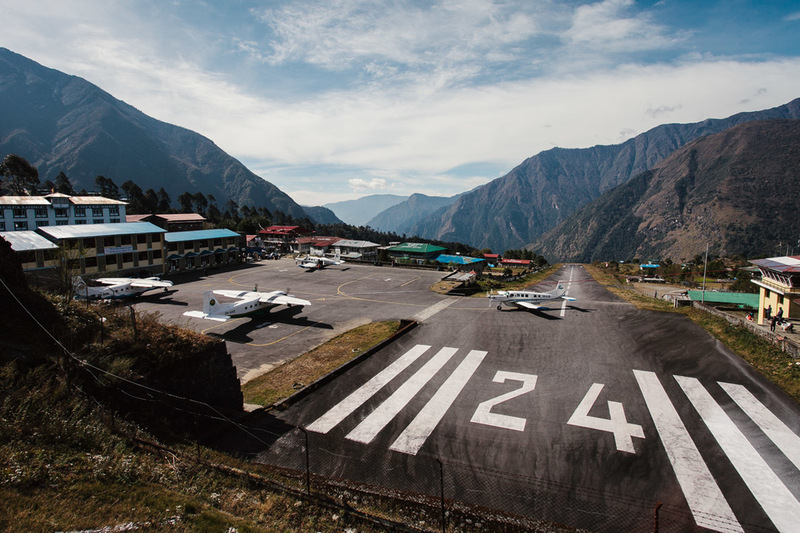 At 2845m, Lukla airport is the gateway to the Everest region, with daily flights operating when weather is good. Due to the committing nature of the valley approach, the short runway (450m), the altitude and unstable weather conditions, this airport is one of the riskiest to fly in and out of in the world. Passengers disembark from a Dornier Do 228 aircraft operated by Tara Air, after a 30-minute flight from Kathmandu. Planes that operate to and from Lukla airport are usually small propeller-powered 18-20 seaters. 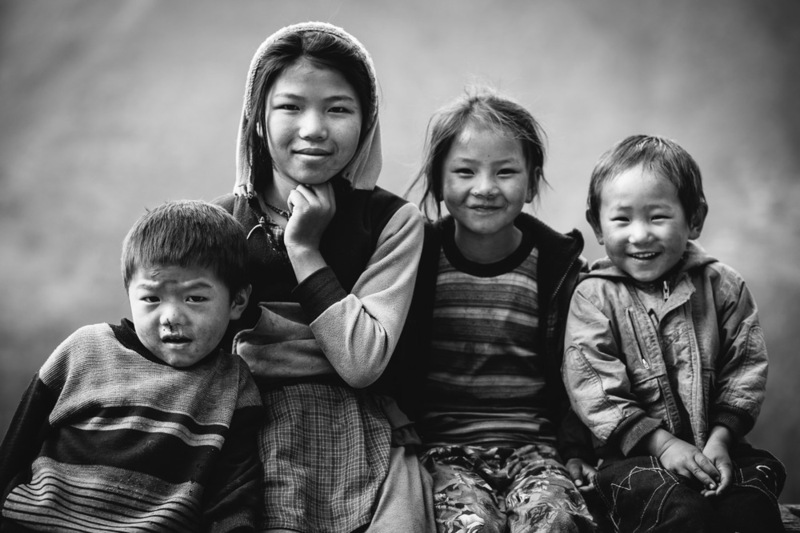 A portrait made on the fly of these Sherpa children who were playing near Lukla airport. A porter enroute from Lukla to Phakding, the next village, and beyond. Supporting the trekking and mountaineering industries in the region necessitates the human and animal powered transportation of goods and supplies along the same trails that travellers take. Ram Kumar Tamang is a porter who plies the routes in the Everest region. On this day, he was carrying cases of beer ordered by lodges along the trail. The strip of cloth on his head, attached to the base of his heavy load, takes a bit of the strain off his back. Namche Bazaar (3440m), often dubbed the “Sherpa capital”, is the center of commerce and tourism in the Khumbu region. It sits in an amphitheatre with a skyline dominated by Kongde Ri, a 6000m peak to the west. Namche Bazaar is by far the largest and busiest town in the Khumbu. Tourism forms a lucrative base of the economy, and while it is dominated by the Sherpas, locals come from all around Nepal for a piece of the action. Dolma is the owner and matriarchal presence of one the lodges in Namche Bazaar. She runs a tight ship, especially during mealtimes which are the peak periods in her day. A helicopter takes off from Syangboche airstrip, which is a short walk above Namche Bazaar. Helicopters are a constant presence in the area - transporting rich clients as well as evacuating trekkers and mountaineers. Kunde and its twin village Khumjung are a few hours by foot away from Namche Bazaar and is usually visited during an acclimatization day. Trekkers climb above and then return to sleep at the altitude they started from. This allows the body to acclimatise to the lower levels of atmospheric oxygen and help prevent acute mountain sickness. One of the ill-effects of tourism and rapid development is the amount of non-biodegradable trash generated. Here, a dzo (crossbreed between yak and cattle) “grazes” in an open landfill in Kunde/Khumjung. The Hillary School was set up by Sir Edmund Hillary as a way to give back to the people who helped him achieve the first ascent of Mount Everest in 1953 with his Sherpa climbing partner Tenzing Norgay. The Hillary School, also known as Khumjung School, caters to more than 350 students across pre-school, primary and secondary levels. Here, a girl waits for her friend as class is about to start. Pasang Lama Sherpa spends his days maintaining a section of the Everest Base Camp trail. He collects toll from trekkers when they pass his “checkpoint”. The Nepalese Army maintains a base just above Namche Bazaar. Outposts in far-flung regions like this attempt to centralise the power of the government in Kathmandu. The soldier here patrols on horseback - the most efficient way of getting around on the trails. The typical setup of a porter includes a large wicker basket reinforced with a wooden frame, and a thick walking stick which doubles as a seat for resting on without having to remove the load. 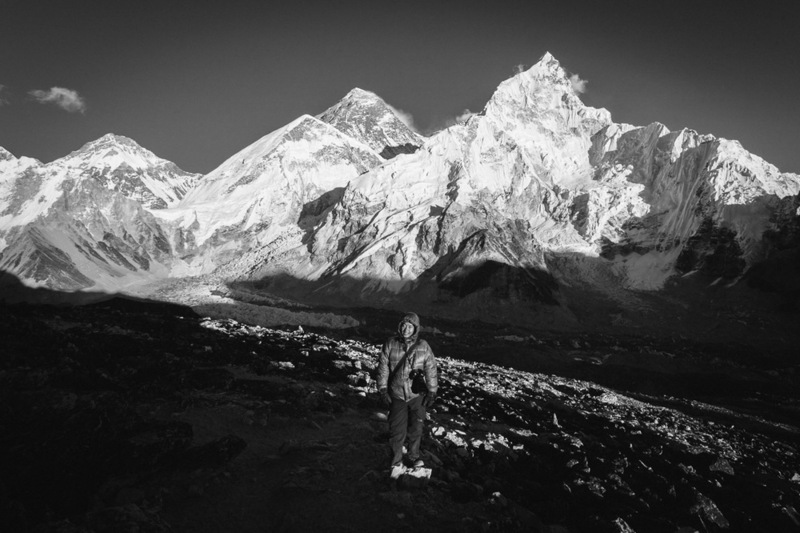 Massive peaks and big alpine faces abound in the Khumbu. 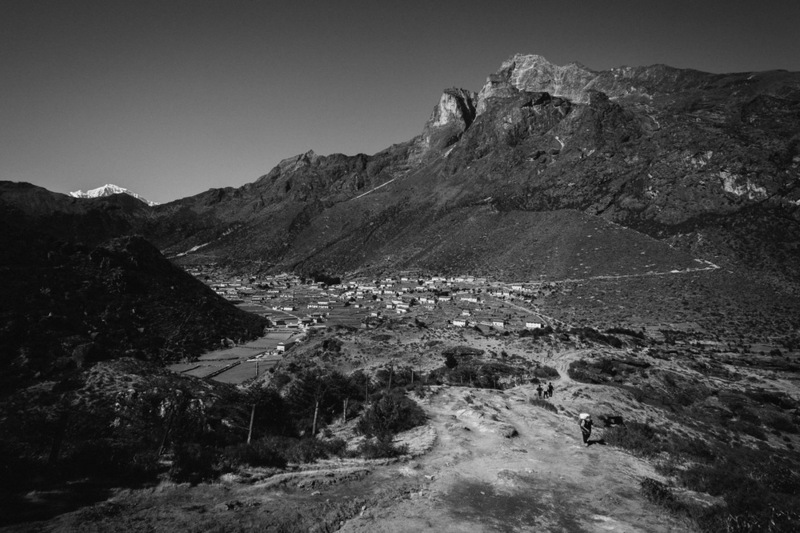 Trekkers turn a corner and are presented with one famous peak after another. 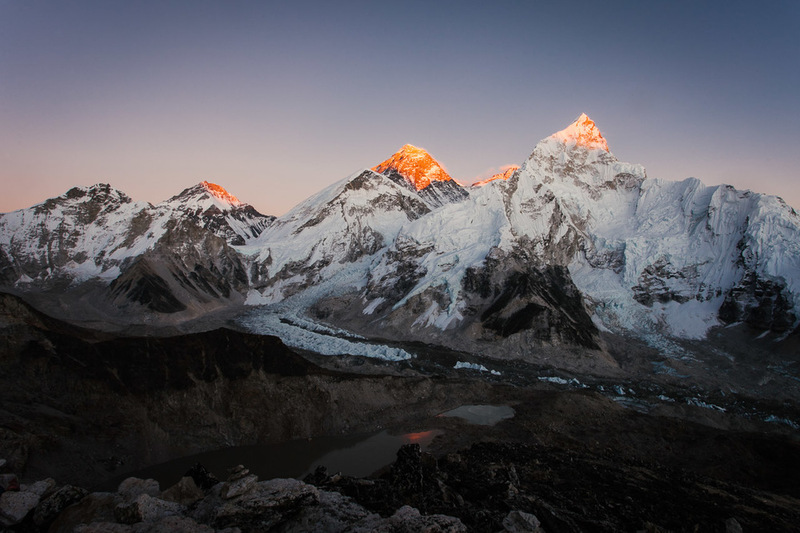 In this frame, the distinct fist-like summit of Ama Dablam (top right), translated as “mother’s necklace”, dominates the skyline. A common scene at high Himalayan villages, clouds appear low and close enough to touch. Dingboche sits at an altitude of 4530m, and is at the crossroads for those continuing on the Everest Base Camp trail, and those headed to Island Peak and Ama Dablam. The clouds dissipate as night falls to reveal the multitudes of stars above the village of Dingboche. Clear wintery skies and low ambient light levels in the region make stargazing a great way to pass time after dinner. Pheriche is home to a clinic operated by the Himalayan Rescue Association, and is usually the first stop for those suffering from altitude sickness, before evacuation to Kathmandu in severe cases. The cold, arid landscape is thrown skywards, sawing jagged lines into this almost otherworldly scene. At 5164m, Gorak Shep is the final frontier before Everest Base Camp and the start of the high Himalayas. In this image, trekkers from Gorak Shep can be seen ascending Kala Patthar, a large nearby dune, to watch the sunset across the Everest range. A portrait of my trekking partner Dewan Rai against the Everest skyline. We met as colleagues at Nepali Times, and he took a very long (and not exactly approved) break off work to join me on this journey. Panorama of Everest (middle) and her sister peaks Changtse (left) and Nuptse (right). A frozen pre-dawn after a particularly sleepless night at Dzongla, where trekkers will spend a night before tackling the Cho La, a high mountain pass, enroute to Gokyo on the other side. Cho La is a mountain pass that sits in a valley at 5420m above sea level, and links the Everest Base Camp and Gokyo treks. Crossing this pass is for many trekkers the single most physically demanding day of the EBC-Gokyo trek. The time required to traverse the few hundred metres of slippery glacier is only about an hour or two. However, including the tough approach and subsequent descent, a trekker might take anything from between 6-10 hours in total. 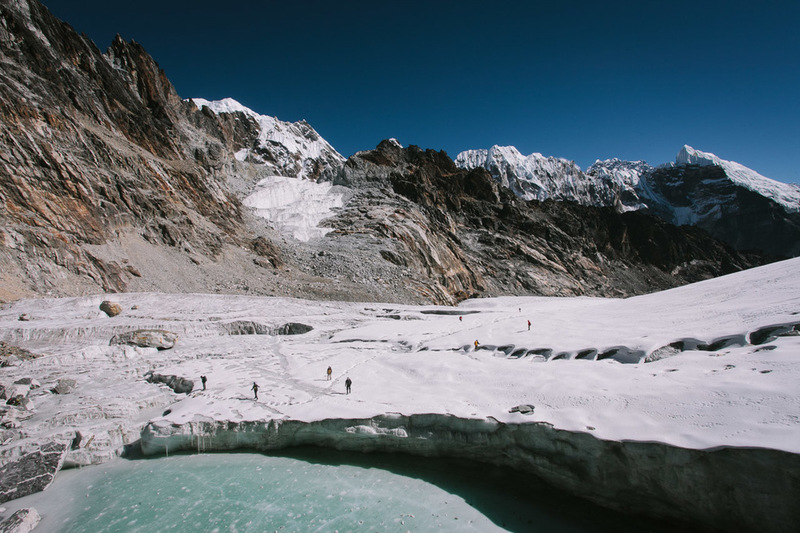 After Cho La and a night at Thaknak, trekkers crest a hill at the end of the gigantic Ngozumpa glacier where Gokyo and its famous aquamarine lakes come into view. These 6 lakes form the highest freshwater lake system in the world. At certain angles and when the wind is still, the Gokyo lakes appear a milky pastel green. A couple more days of walking and trekkers return to Lukla for their flight back to Kathmandu. Here, 2 trekkers are flanked by mani walls inscribed with Buddhist mantras just outside Lukla. Nepalese boys at Lukla, during the festival of Tihar. Tihar is celebrated by Hindus in Nepal over a 5-day period and is similar to Deepavali.